Why won’t Bartolo Colon blow like he did for the Red Sox? Colon Blow. Sounds delicious. But now there’s new Super Colon Blow. Colon, reanimated from his 2006-2009 torpor by way of stem cell treatment of his shoulder and elbow, pitched for only 4⅔ innings and departed the mound with the bases loaded, two out, his team down two runs, and an MVP-caliber batter ready to break open the game. Joe Girardi’s rash managerial style worked in his favor in this instance. He called Boone Logan from the bullpen and the southpaw reliever struck out Adrian Gonzalez with three pitches. Awkard, tentative swings by Gonzalez are as rare as the vaquita, the world’s smallest and most endangered cetacean. David Ortiz took his displeasure with official scorer Chaz Scoggins out on Colon in the fourth with a two-out solo bomb that cleared the Red Sox bullpen. Scoggins had removed an RBI from Ortiz’s statistics from the game against Cleveland on August 3 after a Cleveland public relations staffer passed on a message from Tim Belcher, Cleveland’s pitching coach. Guess who isn’t getting invited to next David Ortiz Celebrity Golf Classic? The Bronx Bromides scored all three of their runs in the sixth when Jon Lester surrendered a leadoff walk to Eduardo Nunez and subsequently seemed to lose command of the strike zone. A number of Lester’s pitches seemed to touch paint but home plate Eric Cooper wasn’t calling them strikes. The visitors exited the top of the frame with the lead and the relief trio of Rafael Soriano, David Robertson, and Mariano Rivera delivered a series-opening victory. 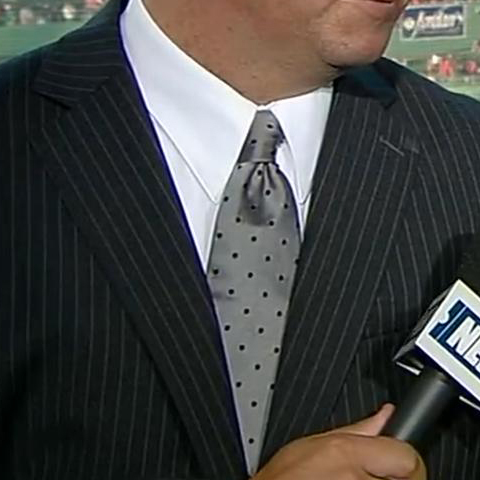 Don Orsillo’s tie was vaquita grey with dots the color of Yankee hearts.